Into The Deep: Open the doors! 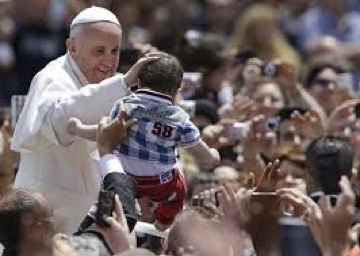 Pope Francis commented on the tension in yesterday's Gospel as some disciples sought to intercept children brought to Jesus for his blessing. Instead of gratitude, the intervention receives a rebuke from Jesus. Jesus embraces [the children], kisses them, touches them, all of them. It tires Jesus and his disciples "want it to stop.” Jesus is indignant ("Jesus got angry, sometimes.") And he says: "Let them come to me, do not hinder them. For the Kingdom of God belongs to such as these. The faith of the People of God, said the pope, "is a simple faith, a faith that is perhaps without much theology, but it has an inward theology that is not wrong, because the Spirit is behind it." The people of God - continued the Pope - "are always asking for something closer to Jesus, they are sometimes a bit 'insistent in this. But it is the insistence of those who believe "
"'Good evening, good morning, the two of us—boyfriend and girlfriend—we want to get married'. And instead of saying, 'That's great!' They say, 'Oh, well, have a seat. If you want the Mass, it costs a lot ... '. This, instead of receiving a good welcome—It is a good thing to get married! ' But instead they get this response:' Do you have the certificate of baptism, all right ... '. And they find a closed door. When this Christian and that Christian has the ability to open a door, thanking God for this fact of a new marriage ... We are many times controllers of faith, instead of becoming facilitators of the faith of the people. But look, this girl who had the courage to carry her pregnancy and not to return her son to the sender, what is it? A closed door! This is not zeal! It is far from the Lord! It does not open doors! And so when we are on this street, have this attitude, we do not do good to people, the people, the People of God, but Jesus instituted the seven sacraments with this attitude and we are establishing the eighth: the sacrament of pastoral customs!"